Transparency Market Research (TMR) has published a new report titled, “Medial Robotic Systems Market - Global Industry Analysis, Size, Share, Growth, Trends, and Forecast, 2017–2025”. 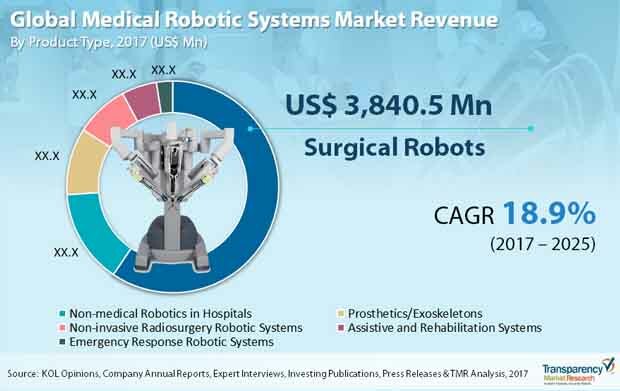 According to the report, the global medical robotic systems market was valued at US$ 6,458.0 Mn in 2017 and is projected to expand at a CAGR of 18.9% from 2018 to 2026. Increase in adoption and demand for surgical robots and rise in the number of products receiving regulatory approval are expected to boost the global medical robotic systems market from 2018 to 2026. The U.S. is anticipated to dominate the global market during the forecast period owing to early availability of novel medical technologies, developed health care infrastructure, increase in adoption of advanced products, and surge in strategic acquisitions to expand product portfolio. For instance, in April 2016, Auris Medical acquired Hansen Medical. Hansen specialize in intravascular robotic catheter systems and offers Sensei Robotic Catheter System and Magellan Robotic System. The market in China and India is expected to grow at a high CAGR during the forecast period. Expansion of the market is attributed to rise in incidence rate of chronic diseases, increase in geriatric population, and surge in demand for minimally invasive surgeries. Rise in adoption of technologically advanced products manufactured by key manufacturers such as Intuitive Surgical, Inc. and increase in number of local players in China are likely to drive the global medical robotic systems market. Medical robotic systems are widely used for minimal invasive surgeries in the field of gynecology, cosmetology, open surgeries, laparoscopic procedures, and flexible endoscopic procedures. Surgeons have rapidly adopted minimally invasive surgical (MIS) techniques for a wide range of applications such as cholecystectomy, appendectomy, gastric bypass, ventral hernia repair, colectomy, prostatectomy, tubal ligation, hysterectomy, and myomectomy. The number of laparoscopic hysterectomy cases is projected to increase during the forecast period. Around 96% of cholecystectomy is done laparoscopically. The report offers detailed segmentation of the global medical robotic systems market based on product type. In terms of product type, the surgical robots segment is projected to account for the largest share of the global market during the forecast period. Technological advancements, new product launches, and increase in purchasing power of hospitals and other health care settings are anticipated to propel the surgical robots segment during the forecast period. In October 2017, TransEnterix, Inc. received FDA 510(k) clearance for the Senhance Surgical Robotic System, a multi-port robotic system for robotic surgery that provides surgeons with technology such as haptic feedback and eye sensing camera control. Significant Incremental Opportunity in the U.S.
Based on countries and sub-region, the market is categorized into U.S., Germany, U.K., France, Italy, Spain, Russia, Sweden, Netherlands, China, India, Australia, Singapore, Brazil, Saudi Arabia, South Africa and Rest of the World. In terms of revenue, the U.S. is likely to continue to dominate the global medical robotic systems market during the forecast period, owing to early adoption of technologies such as the da Vinci Surgical System and rise in aging population. The country is projected to be the most attractive market for medial robotic systems devices, with high attractiveness index. The market in the U.S is expected to expand at a CAGR of 18.4% during the forecast period. Increase in adoption of robotic systems by hospitals, technological advancements, rise in research & development of robotic systems for new applications, and surge in demand for rapid and safe minimally invasive surgery procedures drive the medial robotic systems market in U.S. The report also provides profiles of leading players operating in the global medical robotic systems market. Intuitive Surgical, Inc., Accuray Incorporated, and Stryker are the major players operating in the market. These players offer products with proprietary technologies, for example, Intuitive Surgical, Inc. offers da Vinci Surgical System and Accuray Incorporated offers CyberKnife. Other key player operating in the market include TransEnterix Surgical, Inc., Stereotaxis Inc., ReWalk Robotics, Titan Medical Inc., Medtech SA, Hansen Medical Inc. and Aethon.